The first (successful) pound cake I ever made, was called Five Flavor Pound Cake. Named for its five extracts, coconut, lemon, rum, butter, and vanilla extracts, it has a unique flavor all its own. 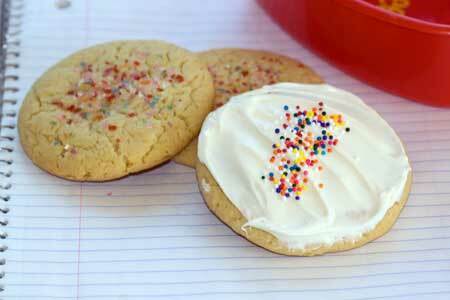 Five Flavor Sugar Cookies are the cookie counterpart. I didn’t have coconut extract so I cheated a little and threw in a handful of unsweetened coconut, but I still got pretty much the same flavor effect. These are chewy very firm, and stay fresh for a while thanks to the shortening. You can frost them or leave them plain. I preferred the plain ones, but the ones that got eaten first were the frosted. In a large mixing bowl, combine the shortening, butter and both sugars. Beat on high speed until light and creamy. Beat in all five extracts. Reduce mixture speed slightly and beat in the egg, followed by the sale and baking soda. By hand, or if using the paddle attachment of a stand mixer, gradually add the flour (I don’t recommend using low speed of an electric mixer because it’s too easy to overbeat the flour). I’m also very late to posting, I’ve started baking, and learning how shortening and cream of tartar is the two that really gives good texture result when baking any kind of cookies. Thanks for trying them! I agree with you on the shortening. It’s not my favorite ingredient in the word, but it really does improve the texture of cookies. I’m a little late for posting, but I did make these on Thursday, and we thought they were great! The flavor is special, and the texture is nice and chewy. I didn’t frost them but did roll them in colored sugar crystals, which added to the texture. I think that frosting them might make the cookie soft after a day or so as it absorbs the moisture from the frosting. I would not replace the shortening as Eric questioned, as that’s what helps give them the special texture, keeps them tasting fresh longer, and lets the flavorings shine through. I just baked Lee’s CCC cookies from the link you provided. They were excellent! I did use salted, browned butter and did NOT omit the 1/4 t of salt and they were still plenty sweet. I love the crackly shiny tops they have. Maybe later tonight I’ll bake another batch and follow the directions EXACTLY!!! THANKS! the imitation butter flavoring is so wicked. i love it–so strong too. Those look good, but – how long do they take to make? we do a lot of cookie sandwich delivery, and whenever we get a sugar cookie inquiry I get nervous because they can be time intensive. Any thoughts on replacement ingredients for the shortening? Good luck at the fair, Gloria! Here’s a link to Lee’s recipe. The next time I feel the need to make sugar cookies I’m going to try these. I’m not a big shortening fan, but these have butter too instead of butter flavored shorteing which I’ve never tried and can’t see myself purchasing even though you’ve found perfectly good uses for it. I’ll have to purchase some of those extracts! Thanks Darlene! I’ll check it out! Gloria, you have come to the right place to find a winner. My favorite chocolate chip cookie that Anna featured (June 16, 2008) is the one she calls “Lee’s Chocolate Chip Cookie” originally by Boston pastry chef Lee Napoli. I have to admit, though, that I didn’t try too many others after finding that recipe with the extra egg yolk that seems to do the trick. It must be hard to know which recipe will please a judge, for example, Anna likes a crispy chocolate chip cookie and my family prefers crisp on the edges and softer in the middle. Good luck! I can’t imagine what the flavor must taste like, but I’m sure if you liked it, I would also! I’ll bet these are amazing! On a different note, I’m starting to practice my CCC for the August, 2012 MN State Fair. My CCC from last year scored 85 out of 100…they didn’t get high marks on texture, flavor, and moisture 🙁 Now I’m going to comb your site for something better!